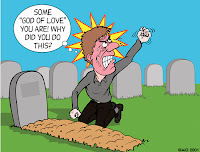 kc bob: Angry at God? This week I have been involved in several cyber conversations about how people often get angry at God. Over the years I have learned that being angry at God is part of the problem of pain. I can only be angry at Him if I believe that he caused or allowed bad things to happen in my life. Even so, there does seem to be two ditches that angry people stumble into. One ditch is where we see God as the author, or at least the permitter, of our pain. Other people lean more towards the Deist ditch and do not see Him involved at all. I think life exists between the ditches. My life got better when I saw my first wife’s death, my families' problems, my health problems and my wife’s disabling paralysis in the light of the healing presence of God. I could not find any life in the idea that God was behind my pain but found so much life when I experienced His presence in my pain. If you are angry at God today I suggest that you examine the root of the anger. Is it because you believe that He was somehow involved and allowed bad things to happen to you or someone close to you? If so I think that you would benefit in examining that belief. Read more about that damaging theology here. It seems that the people I know who have rejected God as the author of pain do struggle with explaining His seeming lack of involvement. They question His presence in their pain because of His failure to intervene and change their circumstances. To be honest, I find this difficult to explain because I am still fumblingly learning to trust, regardless of the circumstances. It helps me to look to people like you who are faithfully walking this path with dignity and courage. Thanks for that encouragement kingdomgrace! 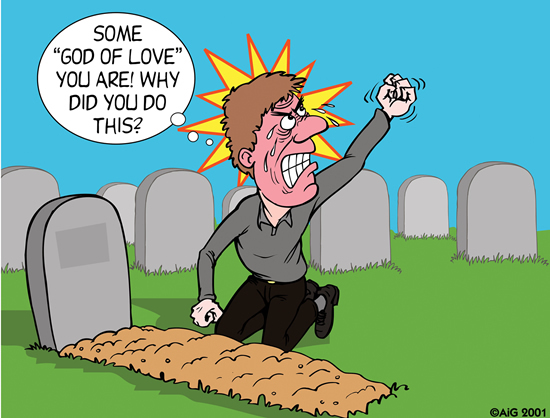 I sometimes fall into the narcissistic view that sees God as the author, or at least permitter, of my pain. It is easy to see how people with such views would be angry. Maybe helping such people to have a different view might result in less rejection of God? I fall into two different ditches. I get into depression or I doubt. I won't say which is worse, these or anger, just that they end up in the same place, distrust and unbelief. And when I find myself there, I work my way out of doubt, but depression is not so easy to get out of. Thanks for sharing Pearlie. Doubt and depression are pretty normal reactions to the bad stuff that happens in life. These feelings tell us that we are human. I have found that taking God out of the cause of bad things helps me better understand things like doubt, anger and depression. In truth, these feelings came because I once embraced the idea that I would not experience them if I simply followed the rules. Lowering Medicare Eligibility to 60?